As an archives consultant, it is difficult to explain to people what I do for a living. Describing what an archivist does is hard enough, but adding the extra layer of consulting makes an elevator pitch nearly impossible! My projects are split between work at home and on site. The virtual work consists of writing, researching, writing grant reports, and photo researching and editing. These projects are straight-forward and don't lend themselves to dramatic before and after pictures. No, so with my on-site work! I want to share with you a recent project I completed to illustrate the work that I do for my clients. To keep anonymity, I will refer to the players in this project as the Author, the University, and the Broker. 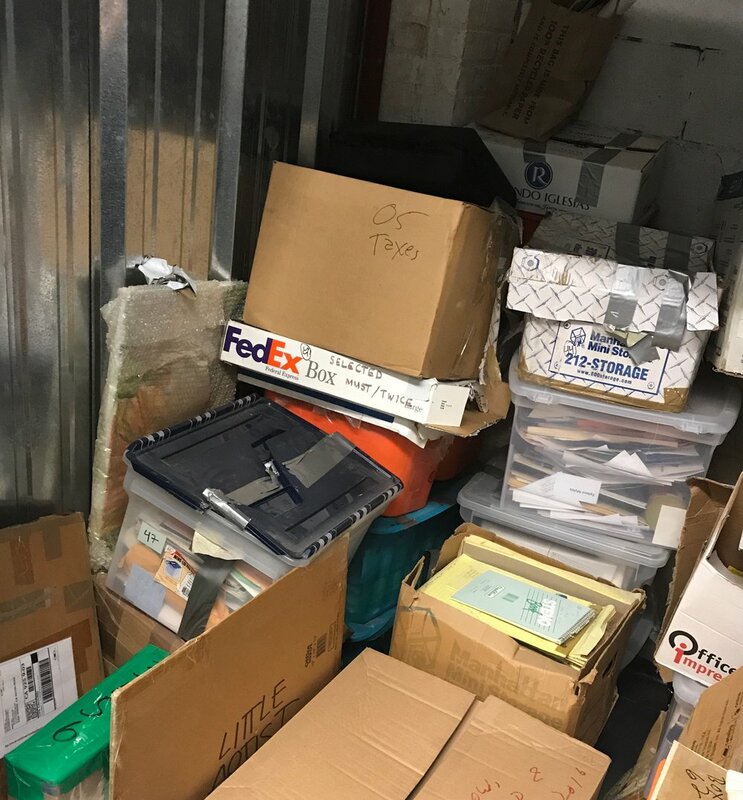 I was hired by the Broker to rehouse and catalog roughly 100 linear feet of the Author's literary archives, located in two storage lockers in a self-storage warehouse in the Lower East Side. Organizing and inventorying the materials allowed for a better determination of the collection’s breadth, content, and context, and ultimately a smoother transition to the University's collections. The University would buy the archives once the work was completed. The materials included notebooks and journals; manuscripts; files including some manuscripts and correspondence; printed matter, including early material; and unsorted bins. Also included were computers and storage media and A/V materials including U-Matics, VHS tapes, CDs, and audio cassettes. I was familiar with the Author's work, so that added a layer of curiosity to the project. 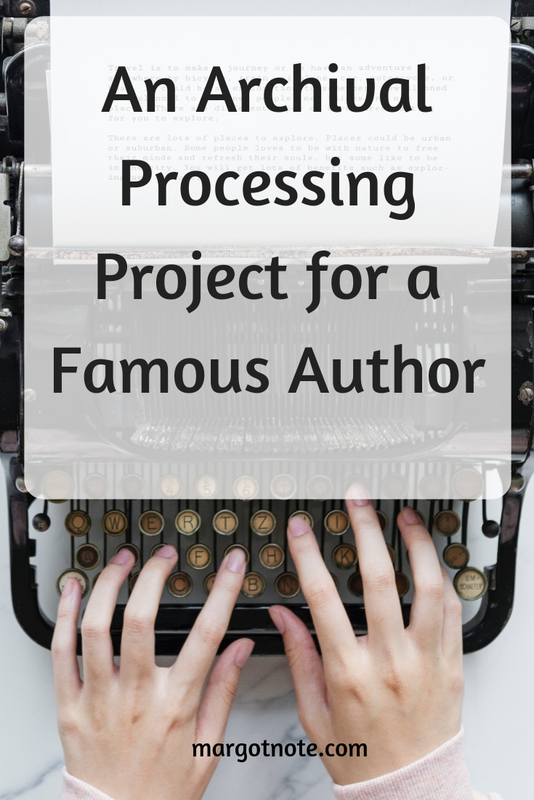 As a writer myself, I always like to discover the processes that writers use in the creation of their work. My scope of work included rehousing the collection in archival folders and boxes. The University was particular about the type of supplies it needed, so the Broker bought the supplies before I began work and then later in the project. I created an inventory that enumerated boxes and their contents, with concise descriptions and date ranges for each box. The descriptions ranged from box-, folder-, or item-level, depending on the boxes and their contents. I used the University's template that transferred the spreadsheet into Encoded Archival Description (EAD), a standard used for encoding finding aids online. Using the template accelerated the University's ability to repurpose my work for accessioning and processing. In layman's terms, I would be entering information about the contents of each box which would later be uploaded into a database and be immediately available. The final spreadsheet was over 2000 lines, which would be a lot of work if someone had to reformat it by hand. Using the University's template saved hours of labor. 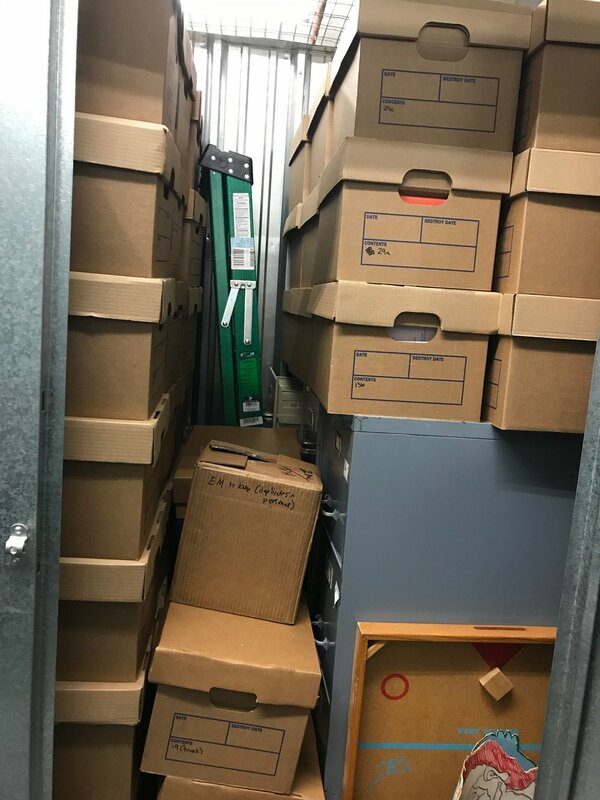 I also noted in the inventory which boxes contained audiovisual materials or electronic media, without removing them from their locations to retain their context. The University is known for buying a lot of archival collections, and my initial pass at processing, arrangement, and description would allow for the University to have some physical and intellectual control of the collection at the time that it was purchased. Parts of the Author's collection were in such a state that I could only organize them to a small degree. In time, the University will process the collection more fully, hiring someone with grant funding to work solely on that collection for years. My initial estimation of the project is that it would take about three weeks or 100 hours to complete. I was accurate with my estimation, but there were some days that I was unable to work because I was waiting for the archival supplies to be delivered. If I had to do the project again, I wouldn't have started until all the supplies were delivered to the warehouse. Fifth floor storage unit, left side. Boxes were piled to the ceiling. Fifth floor unit, right side. The filing cabinets were all full of material as well. Second floor unit: boxes, bins, and bags. I cropped some of the photos to hide identifying details, but you can see that there was a lot of work to be done! 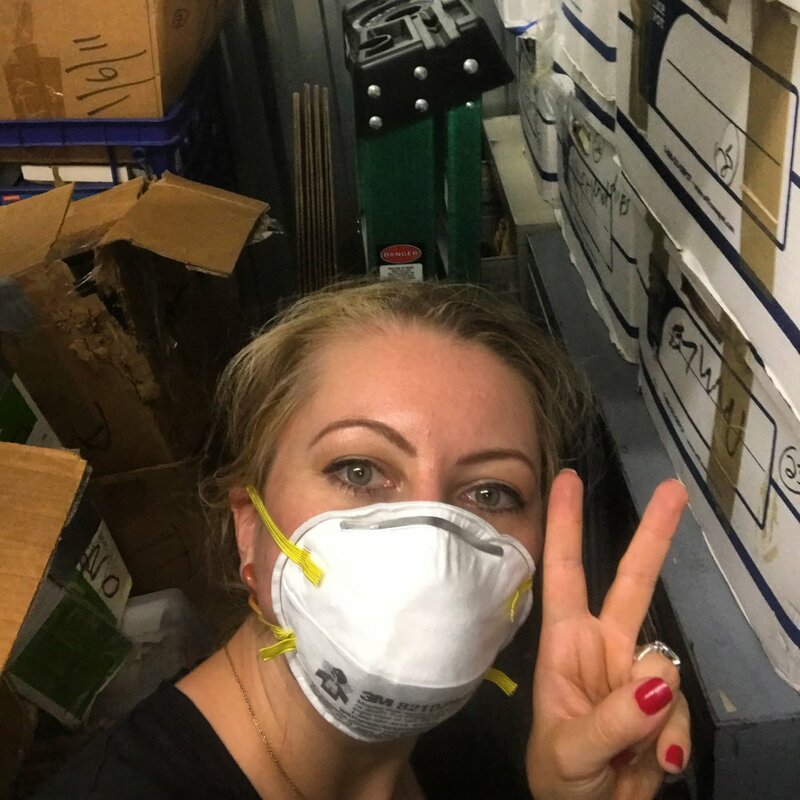 Due to the state of the boxes and their volume, I had to work on site in the warehouse. This was, admittedly, my least favorite part of the project. The warehouse wasn't climate controlled so it was hot, dusty, and stuffy. I got used to it, but I had to make sure that I took breaks and kept hydrated. I reduced my Crossfit classes during this project because I was lifting and arranging so many boxes that I didn't need a workout! I had to pack up every time I used the bathroom or went out to lunch. I found out early in the project that people lived in the facility; they kept to themselves, but I was concerned for my safety. At times, it was eerie to work there. It didn't help that I love true crime podcasts! One time I found myself listening to the Jonestown Massacre Death Tapes on speaker, which echoed among the lockers. I quickly switched to Iron Maiden to lighten the mood. The people who lived there were probably happy when the project was over and the creepy girl finally left! Here's a picture of me on my first day, working through the boxes. I wore a dust mask initially because things hadn't been moved in awhile. As I worked, I no longer needed it. I either got used to the dust or much of it blew away as I worked. Each day, I set up a folding table and chair, opened my laptop, and arranged supplies. Then I pull out boxes, inventoried them, refoldered their contents, and rehoused them in archival boxes. I threw away the old boxes and folders at the end of each day, which was often quite significant. I got on friendly terms with the freight elevator guys. They both separately found my set-up as they were sweeping and said, "Whoa!" 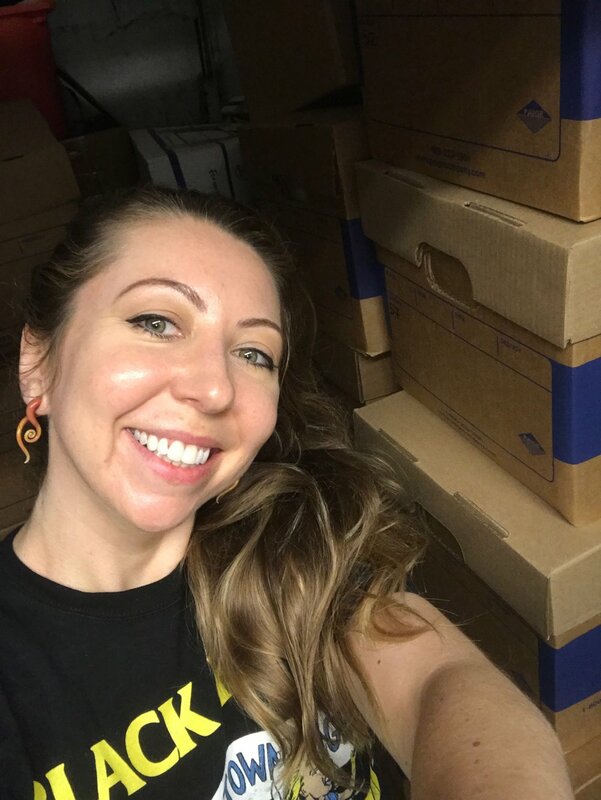 because I was among so many boxes! In the middle of the project. 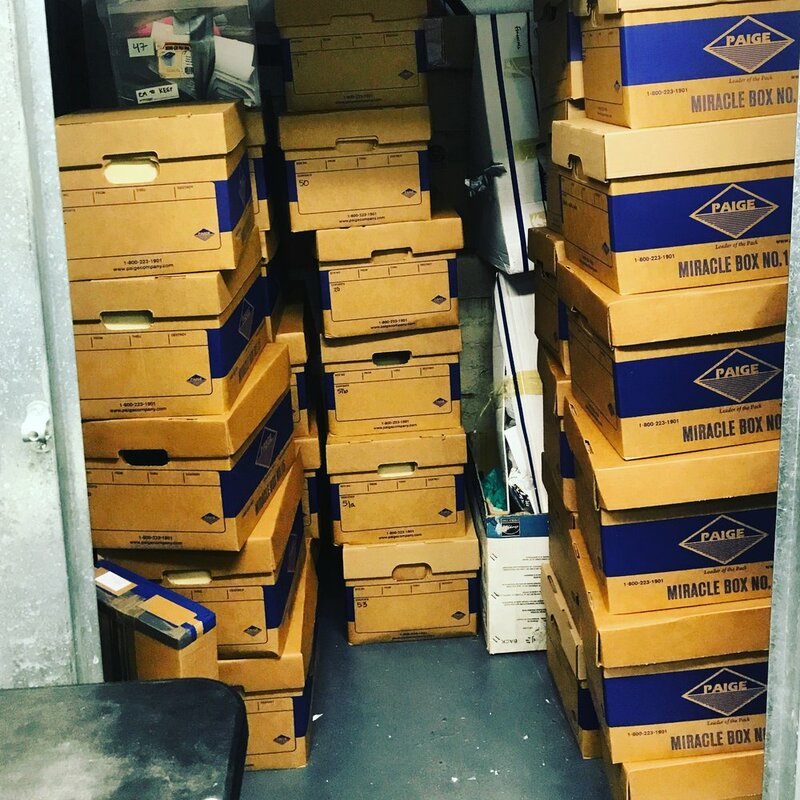 Due to the space limits of the unit and the hallway in which I worked, I often had to pull out most of the boxes from the units. At times, I felt like I was in a giant game of Tetris. Some boxes were a simple transference with refoldering and reboxing into the new boxes. Some of the larger, legal-sized boxes were split into two letter-sized boxes. I often had to move boxes between the second and fifth-floor unit at the end of my workday. I somehow always managed to pile everything into those two units! Some materials already had some distinguishing order to them, such as a box which originated as a filing cabinet drawer. Others were more like Warhol's time capsules where materials were piled on top of each other in plastic containers. I tried to find the order there as best I could. The Author kept manuscripts from students, friends, and colleagues. For masses of papers where I couldn't determine authorship, I left them unfoldered in the boxes. These instances were marked in the scope and content note column on the spreadsheet. The University was aware of these sections and agreed that this was the best solution for now. Throughout the project, I communicated to the Broker and my contact at the University to keep them updated and ask questions. Writers (even famous ones) don't make a lot in royalties. This Author made the equivalent of what I have made on my books per publisher, but s/he had many more deals with different distribution channels. It's important to take breaks. During long days, I promised myself that I would have a sit-down lunch in nearby restaurants. One day, Michael Kelly (Doug Stamper on House of Cards) and Constance Zimmer (Quinn King on Unreal) were having lunch the same time I was. This made my day. You'll always find interesting items when processing people's collections. Just when things are getting monotonous, BLAMO! you'll find something out of the ordinary. I put aside anything I thought would be too personal and had nothing to do with the Author's oeuvre, such as medical, legal, and tax records, in specially marked boxes. The Author will pick these up after the University picks up the rest of the boxes. Scheduling time for this project was important. A lot of my day was spent traveling back and forth to the location as well as setting up and breaking down each day. On warehouse days, I couldn't have meetings with clients (too dirty and sweaty) or take client calls (no reception). I couldn't work on other projects either because of my limited time. I found ways to block my other responsibilities into non-warehouse days. I also found that I worked more efficiently if I switched between days devoted solely to this project and days spent on my other work. In total, there were 100 boxes of material, all neatly organized, and inventoried with precision. Here are the after shots. Is there nothing more beautiful? Fifth floor unit after project completion. Second floor unit after completion; everything not in a Paige Miracle Box will be kept by the Author. One happy archivist: I'm glowing with pride and SWEAT! What a challenging, but fulfilling and fun project! It was a win-win for all players. I got a project that provided me with some hands-on archival work. The Broker got an experienced archivist who could turn the collection around quickly and be on call for future projects. The University got someone whom they knew and trusted, who had an attention to detail only a professional archivist has. Do you have a project that needs archival processing? Contact me at margot@margotnote.com, and let's start a conversaton.